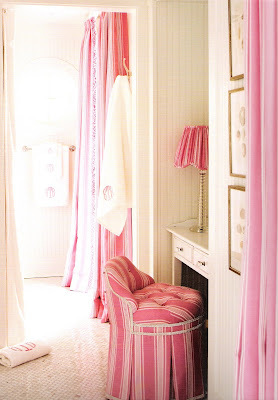 Pink seems to be a color that spurs strong opinions in the design world. People usually love it or really hate it. I personally love pink, but I definitely think it is a color that requires skill in its usage. 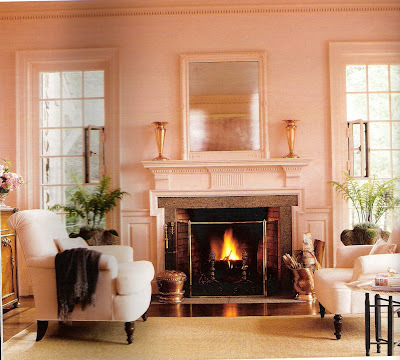 The particular shades of pink that are used also determine the overall effect. Personally, my favorite shades are the pinks that are warm in undertone. Sort of peachy pinks, I guess. 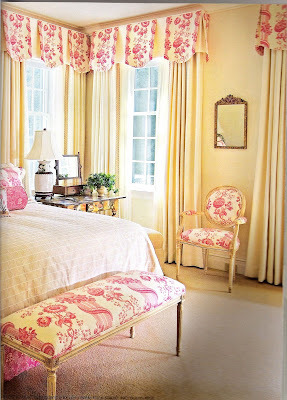 Linda Knight Carr does touches of pink. 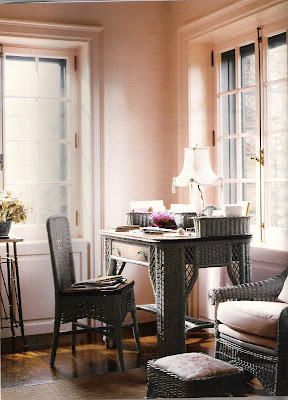 Martha Stewart does pink combined with gray in her guesthouse in Maine. Her idea was to do a continuous wash of ambient color throughout the house, and I think the results are beautiful. I have always heard that cosmetic colors make people look good in their rooms. This another view of Martha's guesthouse. Here she took several mismatched pieces of wicker furniture and painted them the same shade of gray. This picture shows a corner of the bedroom. This house is by the ocean, and Martha says she pulled the color scheme from the colors of seashells, oysters, and misty sunrises. 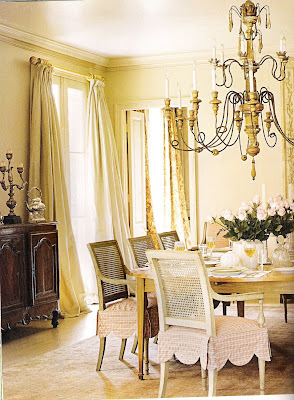 I think it is a beautiful, feminine interior without being too over-the-top girly. 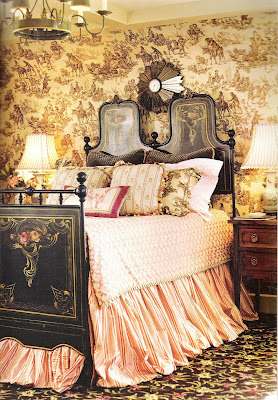 This bedroom is a striking combination of brown toile on the walls, pink fabrics on the bed, and a beautiful antique tole bed. Guess who? Faudree, of course! 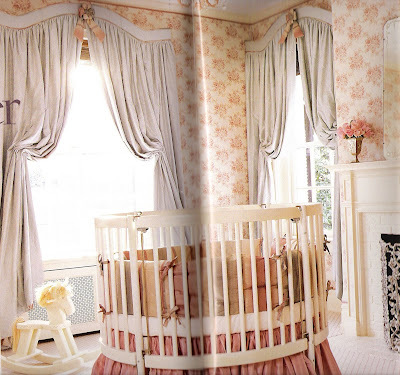 This is a bad scan I know, but I love this nursery by Suellen Gregory. It avoids many cliche' ideas about using pink in a nursery. By using a peachy-pink combined with gray, she achieved a very sophisticated look that could grow with the little girl. Pink vanity stool with rhinestone trim. A Gerrie Bremerrman dining room. 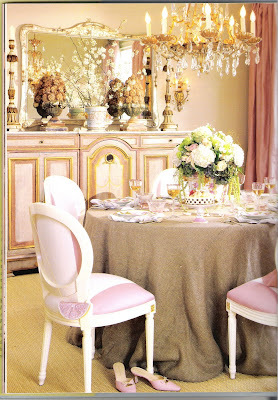 Soft pink on the slipcovers on the Louis XVI chairs. They work beautifully with the rug. A decidedly feminine dressing table. 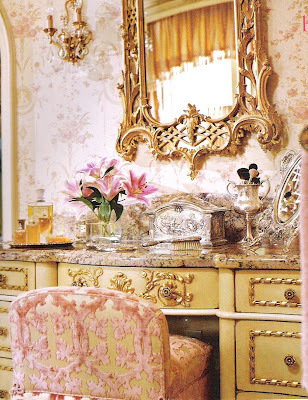 The wallpaper and pink chenille fabric on the stool are luxurious, to say the least. And yes, Charles Faudree again! I didn't realize until I began working on this post how many designers use pink in their work. For a color to have such a difficult reputation, I think these photos illustrate just how versatile and beautiful it can be. what beautiful images - so pretty! I love the iron bed!!! Went looking for reminder of Martha Stewart's guest house and found your compilation of even more pink decor! Wonderful!